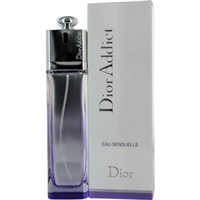 Dior Addict Eau Sensuelle Perfume by Christian Dior, a white floral with slightly spicy tonalities, combines waves of rose, jasmine, white musks and cedar. I LOVE THIS FRAGRANCE. WHEN I COULDN'T FIND IN STORE I THOUGHT IT WAS DISCONTINUED. IF YOU LIKE SWEET SMELLING SCENTS YOU WILL LOVE. I GET TONS OF COMPLIMENTS EVERY TIME I WEAR IT. LOVE LOVE LOVE IT.